SEDONA AZ Hotels, Spas, Restaurants. Activities, Golf, Camping. Cabins, Resorts. Sedona AZ Vacation? Absolutely Glorious. How Do YOU Enjoy Sedona AZ? …when people, planning to come to our hometown, look to us for insight. We can barely contain our puppy-like excitement. Our moods lift… Our eyes fill with light. (Click Here To See Them). & tips. 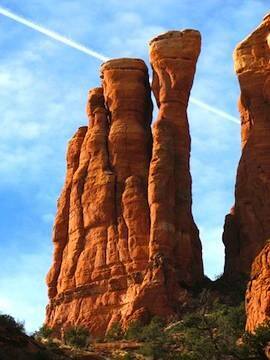 Enjoy Sedona AZ! Beyond the usual tourism attractions (we’ll cover these too, of course) we’ll highlight the most enjoyable aspects of Sedona AZ, so you can find what interests you most. Easily. We'll include the basics, and some superbly surprising discoveries as well. From the uber-luxurious to the dirt-cheap. From high energy excitements to quiet contemplations. And everything in between. Where Do You Stay? | What Do You Do? | Where Do You Eat? By the way, in case you're wondering… these aren't puffy promises. This is the same info we give friends and family. If we wouldn't recommend it to our loved ones, it doesn't make the page. Our aim is to keep it easy-going and highly useful. And we hope you'll feel like a truly honored guest. Whether you’re just dreaming, already planning, or actually standing on Sedona AZ land, here’s a real, honest-to-goodness guide. Hotels. Real Estate. Things To Do. Tours. Hiking. Pictures. Weather. Map. Camping. Coconino National Forest. Ready to get the goodness? Click on any subject that interests you (top left), or click here to go to the Table of Contents, and see mini-descriptions. Or… scroll on! For the full introduction and how to get the most from your options. In case you're interested, here's what you'll find on this site. It is…FULL of Top Picks Lists, insider-tips, and personal stories. Resources, photos, and reviews. It is…FILLED with specifics for first time visitors and seasoned travelers. For potential residents as well as brides-to-be. It is…FOR families, retirees, couples and solos. For thrill seekers, spiritual seekers, and nature lovers. It's even for the dog (pet-friendly vacations). It is…REAL. We'll always do our best to guide you well. We won't sell you a story, but tell you the story. The real story. Do we really know it ALL? Tourism. Hotels. Things To Do. Hiking. Pictures. Weather. Map. Camping. Cabins. Resorts. Nope. But, together, we do know a lot. It’s not that we’re tourism experts. We’re not chamber of commerce reps or Sedona Arizona real estate agents (we know some fine ones, but we're not them). We’re just a bunch of …um…unreserved… people (one local in particular, and all kinds of Sedona enthusiasts) who have been there and loved that, amid the Red Rock splendor… and in a variety of ways. We hope you will too. Find your kind of happy, that is. For example, from hundreds of Sedona Lodging Choices, and hundreds of Things To Do In Sedona, we'll share our best picks, and give you the scoop on what each one offers. So you can find a perfect fit for your particular needs and preferences. Hotels. Things To Do. Hiking. Coconino National Forest. Pictures. Weather. Maps. Vacation Packages. At first, we know this might seem overwhelming to some, but, hey, it doesn't have to be. Catch our easy-going vibe. As you look around this site, you can go deep or keep it light. …and we’ll keep it simple. Easy to navigate. Easy to read. One “click” equals one topic. On each page you’ll find the kind of specific details you’re looking for, along with lots of vibrant Red Rock pictures. for your interest in this site and in our beloved hometown. Now, find what you’re looking for… More? "…the very purpose of life is to be happy." Hotels. Real Estate. Things To Do. Tours. Hiking. Pictures. Weather. Map. Camping. Vacation Packages. Top Picks. We Are Sedona-Happiest Including YOU. Copyright © 2010 SedonaHappy.com. All Rights Reserved. Kindly accept our GRATITUDE for your interest.